Lucine Kasbarian’s father, CK Garabed, is searching for Siserov Kufteh, a Dikranagerdtsi recipe, which is served primarily during Lent. CK, here is a recipe for Seesere Kufta, sent to me by Alice (Doramajian) Bakalian. It was her mother, Baidzar’s recipe. Alice wrote this in a most amusing way; I hope you’ll enjoy reading it as much as I did! A second recipe from Alice follows this one. 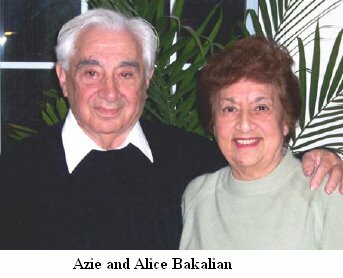 by Baidzar, as written by Alice Bakalian with a sense of humor! Mint - not too much or it will taste lousy. Seesere must be soaked for 3 days - at least! Each day water must be changed twice or you are in BIG trouble. After soaking comes the grinding with the medium blade on your machine. Whatever water accumulates in the machine, pour into ground seesere. If machine is water tight, you are LUCKYYYYYY! If leaking, then I would suggest you pull up a chair and place a pot under the machine to collect seepage. Just thought I’d remind you: Before grinding the seesere, prepare a very large pot with briskly boiling water to which 1 ½ Tablespoons of cornstarch has been added. To continue: Mix all ingredients together. Knead everything with a little water (very little). After mixing, you will form mixture into balls the size of your hand - rounded on top, flat on the bottom. Put these cute little concoctions into the boiling water - Don’t overcrowd! They should swim around like dolphins. While boiling, get yourself and Eberhard #2 pencil. Break off the metal and eraser, then break off the point - making both ends flat. After 20 minutes of boiling, take one of your dolphins out and insert your surgically prepared pencil (or bamboo skewer) into it gently. If it slides off, pick up the pieces from the floor and throw it back into this inferno for about 10 minutes. Try this procedure again. When it sticks to the pencil, you hang out a flag and call all the neighbors because you probably (scrupulously) forgot to wash and cut the 2 pounds of spinach. Certainly they’ll help you! Let them do it in the living room; the kitchen is a disaster area by now! !!!! !Oh My God, What a MESS!!!!! By now your kuftas are done (about 5 hours) and you’re left with this strange gurgling liquid (UGH). Do not drain, I repeat, Do not drain! I assume you’ve put some sumac in the water and brought to a boil, then cooled. This has been sitting around, festering, while all of this nonsense is going on. Drain the sumac and add liquid with a can of tomato paste. Add lemon, to taste, to the gurgle. Cool this (uh, I really don’t know what to call it). ANNYYYWWWWAAAYYY, cook until spinach is soft - and now you’ve got it made! PS: Cut about 2 pounds of onions, very fine. Cook until quite brown in oil. Mince garlic into some water and let it soak for a while. These can be added to each individual dish, if they are so inclined, of course. Chop scallions and parsley; mix well into the ground seesere along with some flour, dried mint, ground coriander, salt and red pepper. Form into flat patties. Fry in olive oil until done. Almost amusing. crossed the line to disgusting. Grandma Rose Cherekjian's recipe. I do not boil the kufteh's in cornstarch water because they kept falling apart so I just fry them and then put them into the spinach soup. Spinach soup recipe ingredients below. Soak the dried chick peas in water for three days. Change the water each day. a total of three grindings. hockey puck. Repeat with rest of mixture. the pan. Heat the oil until hot. Add a drop of mixture to see if it sizzles. a paper towel to drain the excess oil. chopped onions in 2-3 tablespoons of oil until slighlty browned. Add two 14 oz. taste. Bring to a boil and lower to simmer. soup pot and cook for 30 minutes on low. I usually make this three or four days ahead of time as the flavor tastes better. Serve hot or cold. Lemon may be added to taste. Elaine, Thanks so much for sharing these wonderful recipes! Armenian French Toast? Armenian Pancakes? Searching for Recipes - Can you Help?